Please click them to control the slideshow. 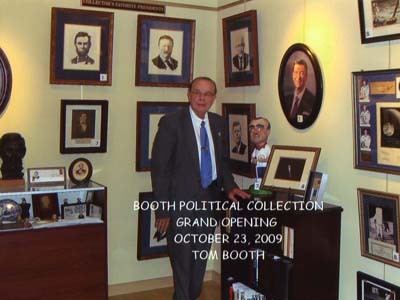 The CAS Gallery located at 107 B Morgan Hall is presently featuring the Tom Booth Political Memorabilia Collection. This is a personal collection donated by alumnus Tom Booth 55’ to the University. It features items from Mr. Booth’s life in National, State and Local politics. The Gallery was opened on October 23rd, 2009 after 3 years of preparation. We hope you enjoy this sampling of the items displayed. The gallery is opened from 10am to 3pm Monday-Friday. It can also be viewed by appointment by calling the College of Arts and Sciences Dean’s Office at 309-298-1828.